Westland Tai Pounini is the National Park best known for its icy terrain. Some of which includes tongues of ice which extend to sea level. Westland Tai Pounini also features the famous Franz Joseph and Fox Glaciers which attract thousands of visitors per year. Fox Glacier was named in 1872 after a visit from the prime minister at the time; Sir William Fox. 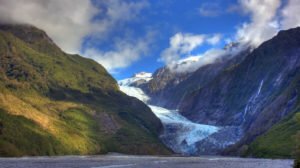 Fox Glacier is currently 13km long and is fed by four alpine glaciers and is one of the only in the world to end in lush rainforest. Franz Joseph Glacier is 20km to the south of the Fox Glacier and is 12km long making it slightly shorter. Franz Joseph Glacier also finishes amongst lush rain forests. The Franz Joseph Glacier was first sighted from the steam ship Marie Louise in 1859 and was later named after Emperor Franz Joseph of Austria. Both Glaciers have retreated and advanced throughout history with much of the recent retreat being put down to global warming.